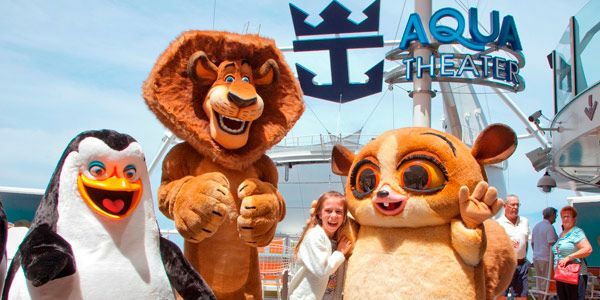 Leave the pencils, books and teacher's silly looks behind (no offence teachers) and join Tracy and Dan of Destiny Tours (along with Alex, the Penguins and other DreamWorks characters) for a March Break getaway cruise aboard Royal Caribbean's Freedom of the Seas. Departing from Port Canaveral, Florida, this Caribbean cruise includes ports of call visits to Bahamas, St. Thomas and St. Maarten. Inside K $975 P.P. $475 P.P. Balcony EI $1,364 P.P. $686 P.P. Pricing is per person in Canadian dollars. Add additional taxes, fee and port expenses of $93.50 per person to above pricing. 3rd and 4th passengers in a cabin are limited and based on availability. Please contact us for details and pricing. All taxes and port charges. Gratuities to ship staff (estimate $10 US per person, per night). Initial deposit of CAD $265 per person (refundable up to December 17, 2012). Balance due December 18, 2012. Flights: Please contact Tracy to get the best flight pricing option for your location.